Arab-Byzantine coin that imitates a Follis (AE22) of Byzantine Empire Emperor Constans II. 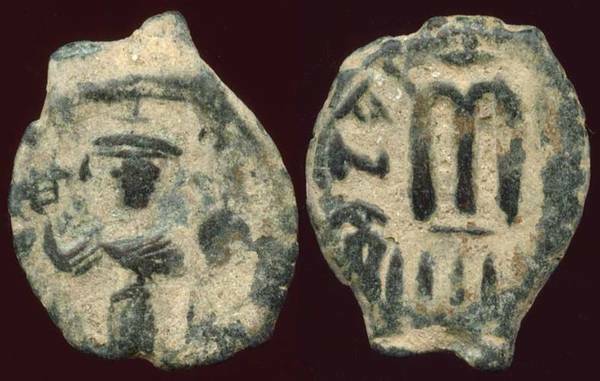 At the advent of Islam, Arabia for the most part had a very limited numismatic history of its own. The past local coinage seems to be limited to that of the Sabaeans, the Himyarites, the Nabataens, and Rome's Provence of Arabia. However, by Muhammad's birth, these were already centuries old. It is generally agreed that in the 7th century AD, Arabia was mostly still a trade-barter society. What little need the local populace had of coinage was sufficiently fulfilled by the then current coinage of the Byzantine and Sassanian Empires. Even after establishing the first Islamic state in AD 622, the Muslims did not institute a coinage of their own. This remained true for Arabia through the end of the Orthodox Caliphate and the early part of the Umayyad rule. As the Arabs spread out and conquered the surrounding lands, all that they really brought with them was the message of Islam. In most cases, the local political and economic infrastructure was left intact. As long as the non-Muslims of the conquered lands paid a Poll-Tax, not much had to be changed. The conquered lands of the Byzantine and Sassanian realms had a rich numismatic history, however, and the use of officially minted coinage had an important place in commerce. To maintain the economic viability, the Arabs continued the previously existing minting operations there - issuing coins from captured Byzantine and Sassanian dies, and then slowly adding new elements to the replacement dies. The first changes were subtle; adding "tayyib" (good) in the recently evolved Kufic script on Byzantine style copper coinage, or short and simple religious statements such as "Bismillah" (with the Name of Allah) on the margins of Sassanian coinage. These changes further evolved as the mint names were duplicated in Arabic in the western lands and the governors added their name on coins in the east. Islamic coinage evolving from these styles are today called Arab-Byzantine or Arab-Sassanian coins, based on the originally borrowed style.